Can you tell when your pet is stressed? Anxiety is a common condition that we hear about from clients time and time again. It can affect both cats and dogs and we see it at the clinic on a daily basis. Sometimes pets are stimulated by specific events such as a visit to the clinic, fireworks or visiting relatives and other times it may not be so easy to pinpoint the stressors. Even little things like running the vacuum may cause pets to pant and shake, panic or even act out in destructive ways. Like humans, pets may even experience physiological changes as a result of anxiety. So what do you do when your furbaby exhibits signs of anxiety? Don’t worry! We know exactly how you feel because we’ve been there too! Thankfully, there are lots of ways to help our pets combat their anxiety. I adopted Cannon in the summer of 2013 while my husband was deployed. 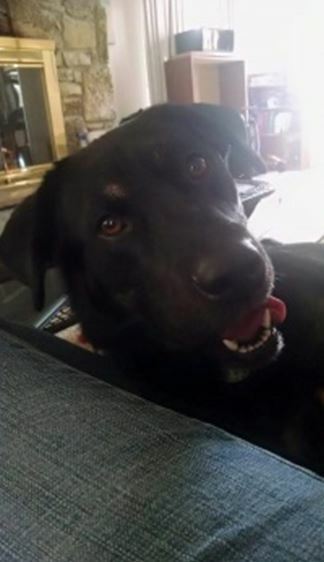 I got him from a Craig’s list ad advertising a 10 month old Lab/Shepherd mix for $40. I was in love the second I saw his picture. I immediately messaged the owner to set up a meet and greet for the next day. At the meet and greet I was told he was destructive when he was left alone and that they kept him in a kennel most of the time because he was too rambunctious for their small child. I adopted him on the spot. He was rambunctious, to say the least. He was constantly on the move, pacing and coming back to me to lick my face and arms. He had no concept of personal space. He had just been moved to a new environment and was still a puppy so I did not worry too much about it. I was able to spend a few days at home with him without needed to leave him. The first time I left him home alone was to run to PetsMart. I did not put him in his kennel. I came home to a GIANT mess. He had gotten into some of my school work and shredded it, there were scratch marks by the front door, and he had also had accidents in the house when he never had before. He greeted me at the door a bundle of energy, tail wagging, whining, jumping and licking. I think he missed me just a bit. I had owned dogs before and understood the concept of separation anxiety. I was not, however, very prepared to deal with it. Sings of separation anxiety include destructiveness, excessive vocalization and house soiling. Cannon displayed two out of three signs. The hallmark of separation anxiety is that these behaviors occur immediately after departures. Additional signs occur when the owner is preparing for departure, such as gathering school work or grabbing keys. 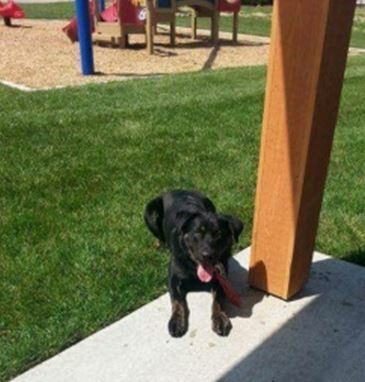 The dog needs to be with the owner as these things occur and follows people when they are home. Cannon was always glued to my side. I did my research and began a plan to help my poor puppy with his anxiety. One out of every six dogs may suffer from separation anxiety. Some dogs have anxiety so severe that cannot be left alone without injuring themselves. Dogs this severe should not be left alone. Some dogs benefit from being placed in a dog day care. Others will adapt to having a specific place to be confined when left alone, such a crate or a specific room. Cannon had a kennel but hated it. He would not even go near it. Due to his previous owners keeping him in the kennel so much he had developed a phobia of being kenneled. Luckily, I had a spare room for Cannon. (Spoiled much?) I placed his bed, food and water in his room. I would place him in the room and give him a Kong toy stuffed with peanut butter and treats. I would gradually increase the amount of time he was in the room by himself. After some time, he began to think of his room as a happy place, a place to eat and get special treats. This managed his separation anxiety for the time being. Other dogs with more severe cases may need the help of medications or Pheromone therapy. 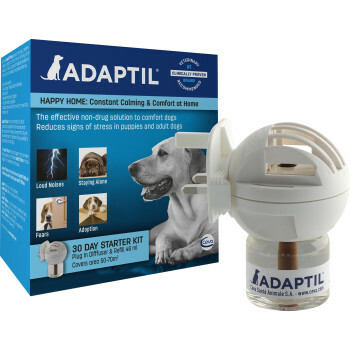 Adaptil is a synthetic pheromone product that mimics the pheromone that mother dogs put out when nursing. It sends out the signal that the dog should feel calm and relaxed. There are several medications that act as a calming agent or sedative. Zylkene, Flouxetine,Trazadone, Diazepam and Alprazolam are several such medications. You should consult with your vet to decide upon the right medication for your dog. Cannon was NOT happy with this. 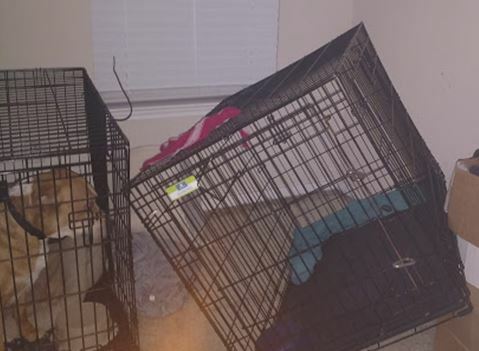 He barked and whined and clawed his way out of the kennel. Once Cannon was out of his kennel he was shaking and would not leave my lap. Cannon had developed thunder storm anxiety. This is not unheard of in dogs with an existing anxiety condition. Thunder storm anxiety is also common by itself. Treating dogs with thunder storm anxiety is very similar to treating separation anxiety. Dogs may try to find a place to hide during a storm. Alleviating the symptoms of storm anxiety may be as simple as giving them a safe place to hide such as a kennel or a comfy corner of a room. Other dogs do well when distracted by a puzzle toy or working on obedience exercises. Thunder shirts may work for some dogs. 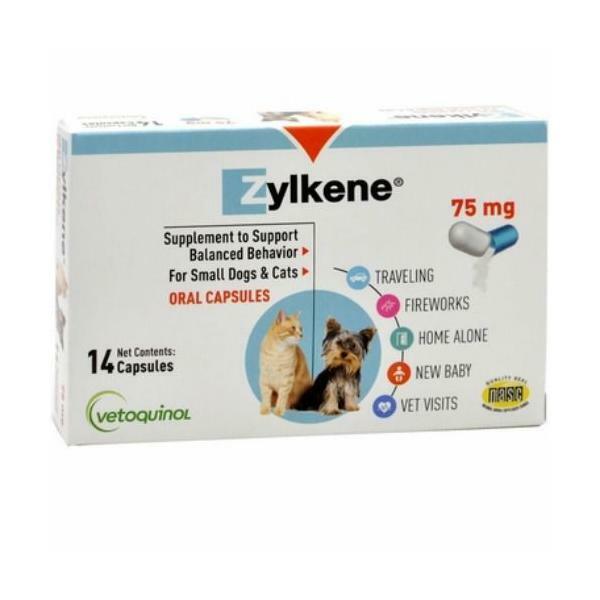 Other dogs may require medication if their anxiety is severe. The medications for storm anxiety are the same as with separation anxiety. Talk to your vet to discuss the best course of action for your specific dog. After talking with Dr. Kuecker & Dr. Richardson, Cannon now wears an Adaptil collar and takes Zylkene once a day. He stays in his kennel while I’m at work and is sleeping soundly through storms. It is such a good feeling to know that he has been relieved from his anxiety and can now enjoy life more without all of the stress that he was previously experiencing. What in the world is Giardia?